Situated by the sea, this spa hotel is within 1 mile (2 km) of Pai Plong Bay and Ao Nang Beach. Phra Nang Beach is 2.8 mi (4.5 km) away. 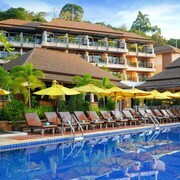 This family-friendly Krabi hotel is located by the sea, within 1 mi (2 km) of Pai Plong Bay and Ao Nang Beach. Phra Nang Beach is 2.7 mi (4.4 km) away. 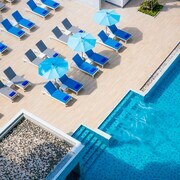 This family-friendly Krabi hotel is within 2 mi (3 km) of Ao Nang Beach and Ao Phai Plong. Ao Nam Mao is 2.4 mi (3.8 km) away. 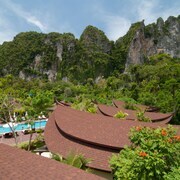 Situated in Krabi, this hotel is within 1 mi (2 km) of Ao Phai Plong and Ao Nang Beach. Phra Nang Beach is 2.8 mi (4.6 km) away. 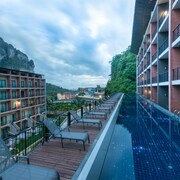 This family-friendly Krabi hotel is located near the airport, within 2 mi (3 km) of Ao Nang Beach and Ao Phai Plong. Ao Nam Mao is 2.7 mi (4.4 km) away. The location of this property is amazing. The hotel staff were friendly and room was clean. This hotel offers anything/everything you need. I love their commitment to sustainability and the service -and staff are simply amazing. The rooms, pool, bar, restaurant, location, convenience - everything is perfect. Great value and one of the best (if not the best) in AoNang!